Finally I come to the last stage of my JRX review. You may want to visit my first two reviews of Midnight Express and Rapid Run for a dissertation on why I'm so fascinated by trains in general and why getting one of these sets will definitely make you want to buy the other two. Railspike is the leader of the Bullet Train team. He is courteous, polite, and intelligent - but don't let that fool you into thinking he's not cut out for battle. He can lock, load, and fire the rocket launchers on his shoulders like any true warrior. To bring down the enemy, he uses a sonic umbrella that emits ultrasonic waves as it rotates. 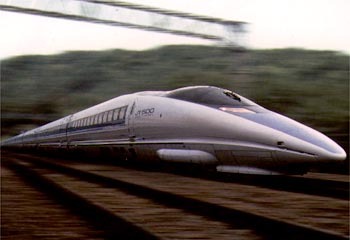 Railspike (or J-5, as he was known in Japan) is modelled after a 500 series Nozomi shinkansen, one of the fastest bullet trains in the world. The 27 meter long and 6.7 meter high train was introduced into service in March of 1997 and soon became the flagship of JR-West. The detailing is superb - the colors of the real train are reproduced on the toy, and even the wheels are appropriately styled. Railspike can even be hitched to the other two trains. Each of the three train robots in this series has an "Advanced" (3) rating for their transformation. Pull the rear section of the train back to get started on Railspike. Split the nose section, then rotate the two pieces down. This will reveal the robot's arms, which can be lowered and rotated into position. Separate the rear of the train to form legs (which will also allow you to remove the hitching mechanism, which becomes Railspike's weapon), raise the flaps by his hips, and rotate the legs just below the knee. Straighten the toes and lower the heels, and you'll be finished with the legs. Simply move the train's cab down to the robot's chest, and his head will pop up; rotate that to the front, and viola! Instant robot. Well, nearly instant, at any rate. 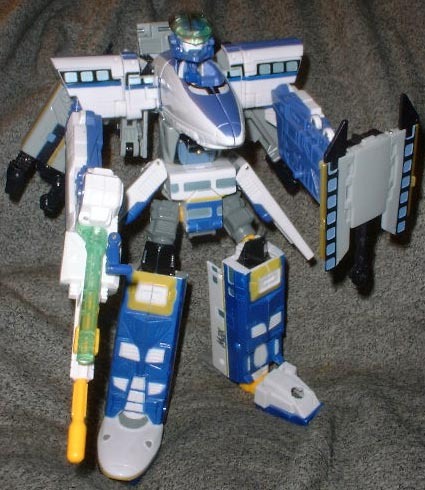 Railspike's blue and white coloring gives him a nice clean look, and his ridiculously oversized shoulderpads do indeed seem quite intimidating. He looks good as a train, he looks good as a robot, and he works well as either. Score! The only drawback was his weapon - it has a light-up feature, and a translucent green tube to act as a barrel to the gun. The tube was lengthened for the North American release and is now too long to fit properly beneath the train, so you have to saw off the end before it will rest properly. The train team are all part of a larger Combiner figure, which is always a plus. My first two reviews covered the individual transformations of the other robots, so this review will explain the final transformation and assembly, and offer a review of the assembled piece. 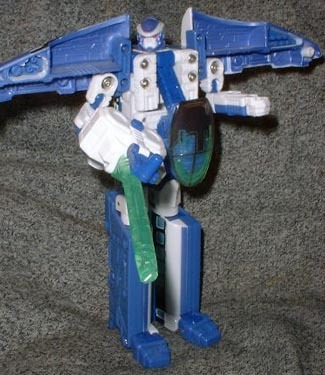 Since we're already in robot mode, we'll start there: return the arms to their position in the shoulderpads, and rotate those pieces back up. Stow Railspike's head, and move his chestpiece (Rail Racer's head) up before bringing the shoulders up together to reform the train's nose. Point his toes down without actually returning them to the train position, and hide his heels. You can now pull his hands down out of his legs, and move the giant thumbs into place. Rotate the legs at the knees, closing them, and close the skirts as well. Now use the very front set of hinges to open the back sections of the train and create shoulders. Move the arms down at the shoulders, and twist them at the elbow to reach the final position. Since you've already assembled the legs and waist of the large combiner (you have already assembled them, haven't you? ), all you need to do is snap the torso in place. Easy, huh? Rail Racer (I still think his Japanese name, JRX, is much cooler) stands just under 9 1/2" tall, and can be moved at the ankles, knees, hips, shoulders, elbows, and neck. The color schemes of the three robots blend nicely together - the blues complement each other and the grey really well, so the giant robot looks like it's supposed to be one giant robot, as opposed to three disparate pieces. That's one mean feat of engineering and design! Rail Racer looks cool, it plays well, and is well worth the purchase. My only complaint about the train series is that all three toys are engines. I understand that each of these was intended to look like a specific train, and they all do look quite good. However, I would have greatly preferred that they were a complete train - engine, car, and caboose. Maybe it's just my fondness for the golden age of railroading shining through, but three bullet trains hitched together look weird to me. Oh well; they're still three fun toys that I highly recommend. What's your favorite form of mass transit? Tell us on our message board, the Loafing Lounge.